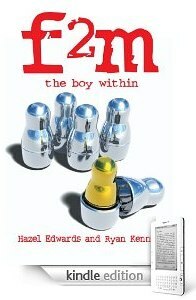 ‘f2m: the boy within’ is now available worldwide at $14.99 US via the wonders of digital technology and the internet. Converting a whole book to Kindle format was a new experience for me. It was a challenge to navigate forums, helpful blogs and Amazon’s own Digital Text Platform (DTP) help pages to get the instructions I needed. I actually converted it from Word to HTML (Amazon converts it to Kindle format) with a sprinkling of Kindle-only snippets that I’m sure are only included to liven up the conversion process. One of the main reasons for writing ‘f2m: the boy within’ was to share information with as many people as possible about what it’s like to transition gender. The e-book version gives us the opportunity to make the book more accessible to those people who want that information in an easy-to-read format. I’m glad we did this, and I look forward to working on the audio book! Ryan – this is all fantastic! I hope you are very proud of yourself my friend. Hoping to be at the book launch later in July. I am, thanks. 🙂 Look forward to seeing you there!